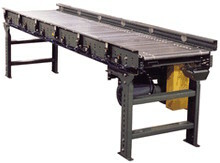 The Hytrol Model 190-NSPEZ & 138-NSPEZ Zero Pressure Accumulation Conveyor is a horizontal live roller conveyor. 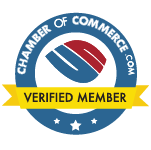 They are designed for Zero Pressure Accumulation of products. Braking in each zone reduces the damage to items during accumulation. 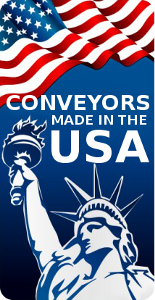 The singulation feature allows products to be transferred from any location on the conveyor. This is how it works… This conveyor is divided into separate accumulation zones. The zones extracts power from the line shaft running the length of the conveyor. 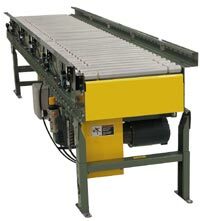 Sometimes pneumatic brakes are applied to the rollers in each zone, stopping the product in that zone. The Accumulation Modules sense a product and accumulate or release the product from that zone.